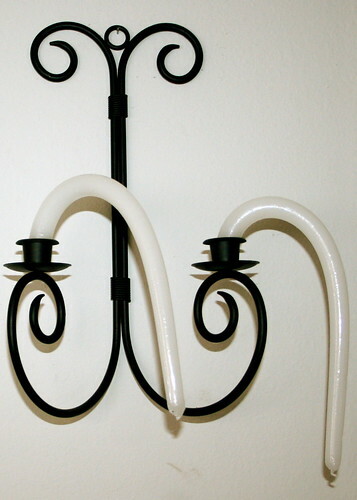 Flaccid Candles, originally uploaded by Temeculamom. Actually my day has been just fine. We’ve got a cousin over, and I’ve got three girls today. By some miracle, it has stopped raining, and all three have been playing together happily (another miracle). But I stopped by my sister’s house, and discovered what her heater had done to her candles. It just mirrors the way I feel some days. Not to mention the Freudian hilarity here. Hope you all are feeling better than this! Have a happy weekend. I’m back to work now. ~ by bekaboo on January 27, 2008. The candles are too funny, and yes I sure have days I feel like they look! About the pictures over the stove, I love them, especially the centre one, i love that era! BWAHAHAHA!!! Those candles are a hoot! Yes I have days like that, I think sometimes more often than not.